Along with warmer temperatures and sunny skies, spring at U-M brings two traditions: the stress of finals studying and the excitement of graduation. Whichever event your student is experiencing, M Gift Packages can ease the anxiety and add a special, virtual hug by delivering snacks, drinks, U-M merchandise, and the message that you’re thinking of them. Stress Buster M Gift Package -- For your student who is deep in finals study, the Stress Buster can provide a study snack break and breather with this big selection of goodies to get any student through exams: bottled soda, crunchy snacks, assorted candy treats, and a U-M travel coffee mug. M Gift Packages are also available with themes such as Get Well Soon, Movie Night, and Good for U filled with healthy snacks and U-M items. Simply place your order by 4 p.m. (EST) two days in advance of when you would like the gift package delivered. Then your student can pick-up the package Monday through Friday at nine convenient Michigan Dining Retail locations (free of charge) and 13 Residential Community Centers for a $10 delivery charge. Just place your order online and select the pick-up or delivery location. 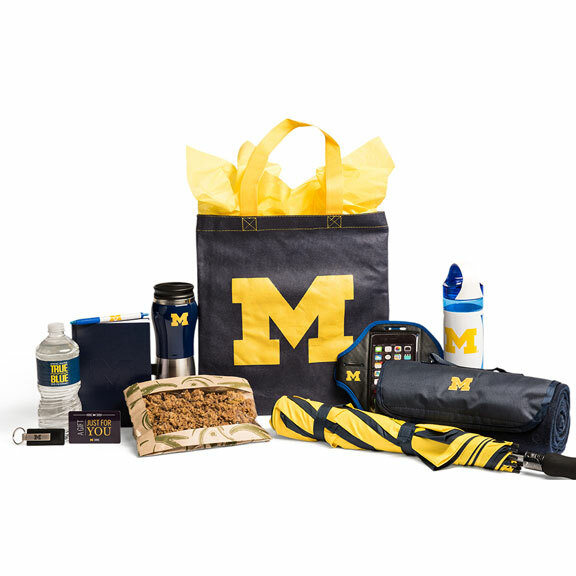 Proceeds of every dollar spent with M Gift Packages goes to support U-M student programs and campus facilities.